Late last month, we reported that the Gingerbread update would be coming to the Motorola DROID X, Motorola DROID Pro and the Motorola DROID 2 Global. Now that Android 2.3 has been received by the DROID X and the DROID Pro, it is the DROID Global 2 that still is owed the update. And all indications are that Gingerbread will soon be coming to the handset. On its web site, Verizon has listed all of the benefits of the download. Besides Android 2.3, the update will give you a new Download Manager app that will help you manage all of your other apps and downloads from the internet and email attachments. After the new upgrade, you will be able to go to a tab under "Manage Applications" and check on which of your applications are presently running with the amount of storage and memory used by each one. Among the changes is a new short-cut to typing numbers from the virtual QWERTY keyboard. Using certain combinations, you can type numbers and symbols without switching to the numeric mode. Plus, you can select a word by using press-hold. Press twice and you can copy the selected characters. There are also new widgets and icons and and new colors for certain screens. Some changes to the calendar-including keeping events in your local time when traveling-are also part of the update. 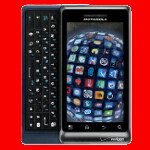 For a complete listing of the changes coming to the Motorola DROID 2 Global with this download, click on the sourcelink. Motorola has been seeking owners of the device to test the update, and speculation is that Motorola DROID 2 Global owners could start seeing Gingerbread by the end of this week. I agree Thump.....I called and talked to a rep at motorola about 4 month ago askingif they were going to update the D2 to GB and they said they didnt have any plan to update any of their phones that are 3g and that they were doing away with the motoblur type interface. Now all of a sudden everyone is getting the update exept my poor D2....LOL....O well guess Im going to HTC or Samsung....By BY Motorola!!!!! Samsung? Good luck luck with those guys bro, right fascinate owners? Maybe I'll try that PlayStation phone or the G'zone commando!?!?!?!?!?! Where's the Gingerbread love for the Droid INCREDIBLE!?!?!?!?!?!?!??!? Hind sight is pretty clear. The amount of factual information in this page ends with 'every phone has gingerbread except the Droid 2 Global'. Here I am, July 25th, still waiting after this site and many others all but promised a June release. Next time don't speculate, just ignore it. Disinformation is worse than no information.